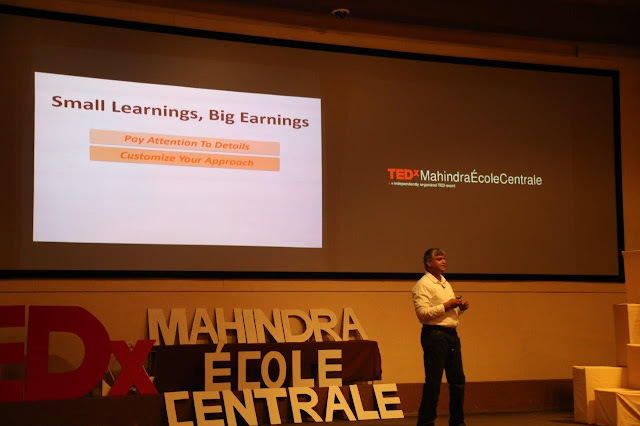 Mahindra Ecole Centrale(MEC), an Indo-French engineering college, hosted TEDx Conference at the campus inHyderabad. This TEDx Conference featured 10 talks from prominent people on the theme “Why not?’’. “Mahindra Ecole Centrale believes in the concept of the “New Engineer” – an Engineer, who has not just core Engineering skills but is also an effective communicator, has management acumen to lead cross-functional teams and has the necessary ingredients to be innovative. We focus on holistic development of the engineering students and are always on the lookout for broadening their horizons”, says Dr. Vegitha Reddy, Dean – Student Affairs, Mahindra Ecole Centrale. “Hosting the TEDx Conference on campus has exposed the students to the TED concept of ‘ideas worth spreading’ and will hopefully make them understand the thinking and philosophies of various leaders and specialists from different walks of life and learn from their experiences”, Dr. Reddy adds. The TEDx Program is designed to help communities, organizations and individuals to spark conversation and connection through local TED-like experiences. The speakers for the event included Hariharan Krishnan, Film Maker, Kaartikeya Bajpayi, Founder and Editor-in-Chief, The Bombay Review, Manish Advani, Marketing Head at Mahindra SSG, Dr. Gurava Reddy, Orthopedic Surgeon, Managing Director, Sunshine Hospital, Shaivya Singh Rathore, Shantanu Anand and Nandini Varma, Spoken Word Poets,Co-founder of Airplane Word Poetry Movement and. “Why Not?” contains an abyss of meaning and possibility, far too much for a simple pair of monosyllabic words. “Why Not?” isn’t merely a rhetorical question; no matter what you say, one can always ask why, the only way you can end this is by saying “Why Not?”. “Why Not?” encapsulates the essence of human innovation. “Why Not?” breaks the chains and loops of linear thinking that we tend to settle into. “Why Not?” is creativity, “Why Not?” is the realization of the fact that there exists a vast sea of knowledge that you haven’t dived into yet. Manish Advani, Marketing Head at Mahindra SSG, talked about how taking risks in choosing the career can lead to professional development and spoke about his own experiences and the learnings thereof. Dr. A.V Gurava Reddy, Orthopedic Surgeon and Managing Director, Sunshine Hospital, engaged with the audience on the dynamics of doing things differently. Kaartikeya Bajpai, Founder and Editor-in-Chief, The Bombay Review, talked about the disconnect betweenyoung students and the outside world and making a difference. Shantanu Anana and Nandini Varma, Spoken Word Poets, Co-founder of Airplane Word Poetry Movement, talked about poetry and how slam poetry broke the conventional norm and personalized poetry. V.R Kaundinya, GMO Expert, Director General of the Agricultural Group, ABLE, talked about theissues related to Food Security and the challenges therein or volume and food safety. He stressed on the need to create futuristic solutions that will remain good for the next 50 years or so. The Raga Muffins, an independent music band from Hyderabad performed and shared their insights on story telling and expression through the music format. Hariharan Krishnan, Film Maker, talked about the evolution of Indian Cinema over the ages and the ‘personal, family’ angle in it. Dr. Prasad Bhatt, Entrepreneur, Researcher, talked about taking Internet to non-urban users and effectively utilizing its potential. Shaivya Singh Rathore, Educator, Climate Activist, Co-founder of Base Camp Education Foundation, talked about her experiences after changing her profession from Aeronautical to a Teach For India Fellow and how she now strives to help fight the climate change and also the Educational Crisis. Her experience in teaching the underprivileged children has not only taught kids but also shaped her life personally. Mahindra Ecole Centrale(MEC) college of engineering is an international technology school, that marks the foray of the USD 17.8 billion Mahindra Group into the higher education sector. Mahindra Educational Institutions, the wholly owned subsidiary of Mahindra Group’s IT venture, Tech Mahindra, collaborated with École Centrale Paris - now CentraleSupélec - in 2014, to establish MEC in India. École Centrale is one of the oldest and most prestigious engineering institutions in France with a heritage that goes back to nearly 200 years. MEC is approved by AICTE and Jawaharlal Nehru Technological University (JNTU) Hyderabad, a premier institution with academic and research-oriented courses. MEC offers a truly international programme with an inclusive focus on the Engineering, Social and Creative sciences, Liberal Arts, Philosophy and Humanities. It offers an environment of unique cultural immersion – of participants, faculty and staff. MEC offers international exchange study opportunities with mandatory global internships. The B.Tech degree at MEC is a research-driven program with close links to industry. A world class faculty, with a mix of rich industry-academic background, global exposure and research focus ensures that the content remains contemporary, aligned to the global business requirements. MEC is committed to providing world-class infrastructure to support a strong research vision in thrust areas such as Energy, Environment, Communications, Infrastructure, Transportation, Materials, and Defence. Based in Bahadurpally, Hyderabad, MEC is situated in a sprawling green campus of 130acres flanked by the Tech Mahindra Technology Centre and Tech Mahindra SEZ. MEC has an intake of 240 for its 4 year B.Tech Program(60 seats for each of the four courses–Computer Science & Engineering, Electrical and Electronics Engineering, Mechanical Engineering and Civil Engineering).